Encyclopedia of Social Work is the first continuously updated online collaboration between the National Association of Social Workers Press) and Oxford University Press. Over 700 overview articles, on key topics ranging from international issues to ethical standards, offer students, scholars, and practitioners a trusted foundation for a lifetime of work and research, with new articles and revisions to existing articles added regularly. Harriet Ross Tubman’s heroic rescue effort on behalf of slaves before and during the Civil War was a lifetime fight against social injustice and oppression. Most people are aware of her role as what historian John Hope Franklin considered the greatest conductor for the Underground Railroad. However, her rescue effort also included her work as a cook, nurse, scout, spy, and soldier for the Union Army. As a nurse, she cared for black soldiers by working with Clara Barton, founder of the American Red Cross, who was in charge of front line hospitals. Over 700 slaves were rescued in the Tubman-led raid against the Confederates at the Combahee River in South Carolina. She became the only woman in U.S. history to plan and lead both white and black soldiers in such a military coup. It is the latter activity which caused black feminists in Roxbury, Massachusetts to organize themselves during the seventies as the Combahee River Collective. When Tubman died, she was given a military burial with honors. It is also Tubman’s work as an abolitionist, advocate for women’s suffrage, and care for the elderly that informs black feminist thought. It is only fitting that we remember the life of this prominent nineteenth century militant social reformer on the 165th anniversary of her escape from slavery on 17 September 1849. Tubman was born into slavery around 1820 to Benjamin and Harriet Ross and given the name Araminta. She later took her mother’s name, Harriet. As a slave child, she worked in the household first and then was assigned to work in the fields. Her early years as a slave on the Eastern Shore of Maryland were traumatic and she was sickly. An overseer threw an object that accidentally hit Tubman in the head. The head injury she sustained caused her to have seizures and blackouts all of her life. She even had visions and this combined with her religiosity caused her to believe that she was called by God to lead slaves to freedom. It is believed that her work in the fields gave her the physical stamina to make her rescues. She was married in 1844 to John Tubman, a free black man, but her anxiety about being sold caused her to run away to Philadelphia and leave John behind. Runaways were rare among slave women, but prevalent among slave men. Harriet Tubman by H. Seymour Squyer, 1848 – 18 Dec 1905 (National Portrait Gallery). Public domain via Wikimedia Commons. 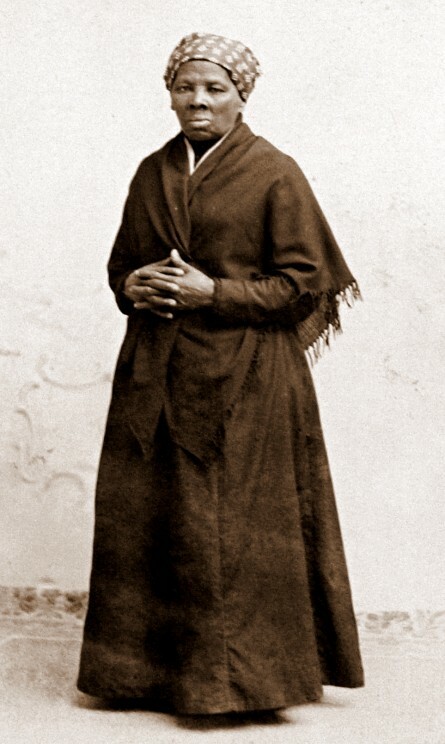 Between 1846 and 1860, Tubman successfully rescued close to 300 family members and other slaves. She became part of a network of prominent abolitionists who created escape havens for passage from the South to Northern cities and then on to Canada. The recent award winning film, Twelve Years a Slave reminds us that even free blacks were subject to being turned in as a runaway after passage of The Fugitive Slave Law of 1850. Tubman was bothered by this new law and was eager to go directly to Canada where she herself resided for a time. She made anywhere from 11 to 19 rescue trips. The exact count is unclear because such records were notkept in this clandestine social movement. Maryland plantation owners put a $40,000 bounty on Tubman’s head. She was never caught and she never lost a passenger. Like Patrick Henry, her motto was give me liberty or give me death. She carried a pistol with her and threatened to shoot any slave who tried to turn back. The exodus from slavery was so successful that the slaves she led to freedom called her Moses. She was such a master of disguise and subterfuge that these skills were used after she joined the Union Army. It has also been reported that the skills she developed were so useful to the military that her scouting and spy strategies were taught at West Point. She purchased a home in Auburn, New York where she resided after the Civil War. Her husband, John Tubman, died after the war, and she married Nelson Davis, another Civil War veteran. From her home in Auburn, she continued to help former slaves. Historian Gerda Lerner once described Tubman as a revolutionist who continued her organizing activities in later life. Tubman supported women’s suffrage, gave speeches at organizing events for both black and white women, and was involved in the organizing efforts of the National Federation of Afro-American Women. After a three decade delay, Tubman was given $20 a month by the government for her military service. Tubman lived in poverty, but her mutual aid activities continued. She used her pension and money from fundraising activities to provide continued aid to freed slaves and military families. She died in 1913 in the home she established for the elderly and poor, the Harriet Tubman Home for Aged and Indigent Colored People, now a National Historic Monument. Harriet Ross Tubman escaped from slavery, but remembered those she left behind. She was truly an historic champion for civil rights and social justice. Heading image: Underground Railway Map. Compiled from “The Underground Railroad from Slavery to Freedom” by Willbur H. Siebert Wilbur H. Siebert, The Macmillan Company, 1898. Public Domain via Wikimedia Commons. Wilma Peebles-Wilkins is Dean and Professor Emerita at Boston University, an NASW Social Work Pioneer, and a member of the Scholars Advisory Committee for the Social Welfare History Project. She is the author of the Harriet Tubman biography in the Encyclopedia of Social Work. You said: “An overseer threw an object that accidentally hit Tubman in the head”, but that’s wrong because Harriet refused to help the overseer look for the slave so he threw the object on her. Brian, actually there are contradicting accounts about the overseer throwing the object at Harriet Tubman. My sense is there was conflict, but he did not deliberately try to hit her in the head.